Renowned in Iran and across the globe, Prof. Iraj Nazeri is a trailblazing interventional cardiologist offering care you won’t find anywhere else. We offer a wide range of cardiovascular services to diagnose and treat heart disease, to prevent it from advancing and improve your quality of life. Whether you need an accurate diagnosis or a cutting-edge minimally invasive surgical procedure, Prof. Nazeri provides the care you need. With more than 30 years of experience in the diagnosis and treatment of heart diseases, Prof. Iraj Nazeri, FACC is committed to providing excellent care to our community. 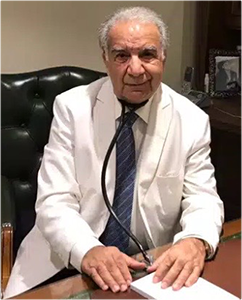 As an interventional cardiologist and professor of medicine at the Tehran University of Medical Sciences, Prof. Nazeri pioneered the practice of interventional cardiology in Iran. In 1987, he performed the first coronary angioplasty in Iran. His lifetime goal has always been to provide the highest level of care to his patients and our community. Prof. Nazeri has devoted decades to teaching at the Tehran University of Medical Sciences, with a strong commitment to passing along his knowledge. He has proudly trained and observed hundreds of his students, residents, and fellows, continuing his legacy in Iran and all around the world.